I have thin-sliced zucchini and steamed it for use in my soup. One of the zucchini turns out to be bitter. I have saved half of it for use on the next day. Is there a cooking method that will remove the bitterness from that same zucchini, preferably with a presentation that is similar to steaming? When I cook zucchuni I slightly scrape the skin with help of a knife to reduce the bitterness. Also for some meals prepared by mashing, I peel the skin off. Having bounced around to the various other sites I basically had what I've heard anecdotally before confirmed; salt and lay out to drain liquid. I suppose the implication is that by dessicating the zuke a little bit, it can remove the Cucurbitacin (which is a steroid developed to ward off herbivores). Putting the zukes in salt water is also recommended by some. It appears that people can become ill from incredibly bitter zukes, so be wary of eating extremely bitter ones. In this case, you may want to follow the wisdom of your taste buds and drop the zucchini in the trash. Also, salt masks bitter flavors; it's one of the reasons that, for example, bacon goes so well with cooked greens. 2) Press the stub / courgette surfaces back together and rotate the stub end against the courgette continually for a couple of minutes. 4) Once it's stopped leeching out (or you're bored!) wipe off the white stuff and discard the stub. 5) Continue to prepare / cook / eat as planned. It should taste better! 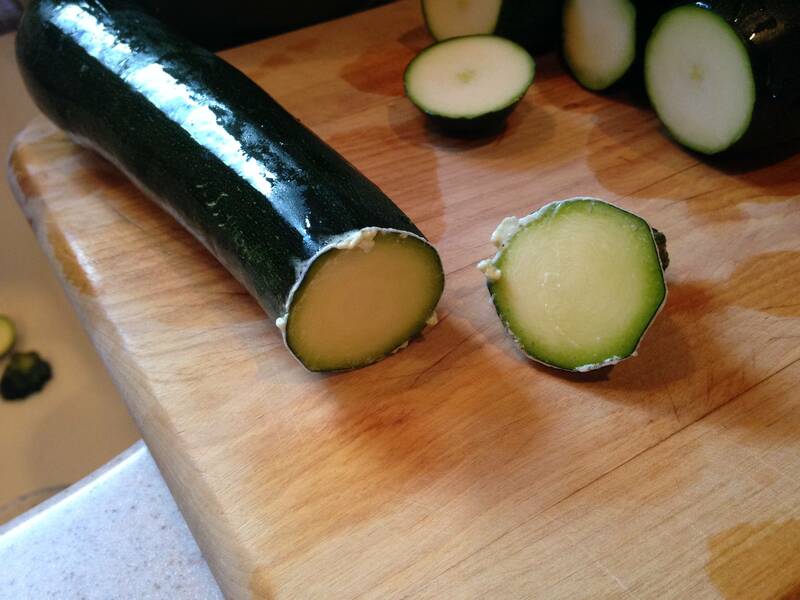 Cutting off the tip of the zucchini with the stem part and rubbing the two cut ends together, is also what a Californian friend of mine recommended to me years ago. But after rubbing and letting the white liquid come out, I cut another slice of the zucchini off, to be sure none of the white liquid is still on there. This method works most of the times for the bitterness to be gone. From personal experience though, I have noticed that whenever the peel is very thick and dark it is best to peel the zucchini, because then its the only way to get rid of the bitterness, which goes as well for cucumbers. Your Sri Lankan friend was right. Here in India we do the exact same thing for cucumbers, which is from the same family as zuchinni. Taking out the white stuff makes it less bitter. In addition, before rubbing the two surfaces together, you should lightly poke the two surfaces three to four times with your knife. This helps in taking out the white stuff better. Not the answer you're looking for? Browse other questions tagged vegetables flavor zucchini or ask your own question. Can you freeze chopped zucchini?